The highly anticipated Season 4 for 'Fortnite' will be released tomorrow. Season 4 is almost here in "Fortnite"
Today marks the last day for Season 3 of "Fortnite" and players with the Battle Pass are trying their hardest to get all the way to level 100 to unlock all the special items and emotes. Last week was crazy for "Fortnite" players because Epic Games kept teasing the community with little clues as to what the next season would bring. The meteors over the map were the beginning of the clues and it slowly built up toward the end of last week. Epic Games revealed that the next season's theme would most likely be superhero-based according to their first Twitter post about the new season. Every day following that, Epic Games posted a new Tweet showing a new image within the meteor. According to Forbes, Epic Games released their final teaser for what is going to happen when the new season starts. The new season for "Fortnite" will begin tomorrow and Epic Games has scheduled downtime early in the morning to roll out the new season. Season 4 will bring along a new Battle Pass, a superhero theme, and meteors hitting somewhere on the map. The Twitter post by Epic Games today shows four figures with their faces not showing, but players might be guessing that the four figures are the same ones in the images on the meteor teased by Epic Games. It could, however, be an entirely different set of skins Epic Games plans on releasing with the new season. Nevertheless, players are expecting some sort of superhero versus villain theme and are awaiting the new skins and new season. Along with the image in the Twitter post, there is a caption saying, "Brace for impact!" which of course refers to the meteors that have been raining down on the map for the last couple of days. Although the meteors have been striking various parts of the map, there might be a huge meteor crashing down onto the map when the new season begins. Players hypothesized that the meteors were supposed to hit Tilted Towers, but some leaks stated that the meteors may in fact be hitting Dusty Depot. 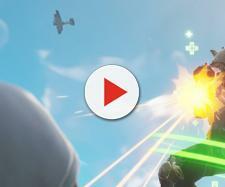 Whatever the case, the meteor will have a huge impact on the game. According to GameSpot, the big meteor may be a setup for the new Battle Pass for Season 4 and may bring along different weekly challenges and different skins for players to purchase. Epic Games, however, has not provided any information on the Battle Pass for Season 4. If the price for the new Battle Pass is the same as Season 3, then players can expect to purchase the Season 4 Battle Pass for 950 V-bucks.